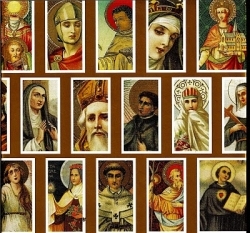 One practice of some Christians that is so misunderstood today is a devotion to patron saints. Spiritually and religiously from the earliest days of the Church, groups of the faithful have chosen a particularly holy person who has passed on to intercede, as well to hold up as a model, for the community in their walk with God. **Anthropologically this practice reveals a basic human trait - the individual is more inter-dividual, relying on the other, and that aside from the biological basics, we desire and yet we do not know for what. The fact that we are social animals taking our cues from one another, seeing others with certain status and/or goods, intuit that those things must be desirable, and then start wanting them ourselves - we begin to covet resulting in competition, rivalries and inevitably violence. From this very good and very basic human trait we can observe how easily the good may turn nasty especially when our model is our next door neighbor. Before becoming a preacher, however, Bernardine spent several years ministering to the sick and dying. He enrolled in a religious association that served at a hospital in the town of Scala, and applied himself to this work from 1397 to 1400. During that time, a severe plague broke out in Siena, causing a crisis that would eventually lead to the young man taking charge of the entire hospital. Inside its walls, up to 20 people were dying each day from an illness that also killed many of the hospital workers. The staff was decimated and new victims were coming in constantly. 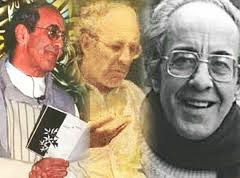 For almost a dozen years he lived in solitude and prayer, and discerning his gifts he felt God calling him to preach. Especially known for his devotion to the Holy Name of Jesus, Bernardine devised a symbol—IHS, the first three letters of the name of Jesus in Greek, in Gothic letters on a blazing sun. 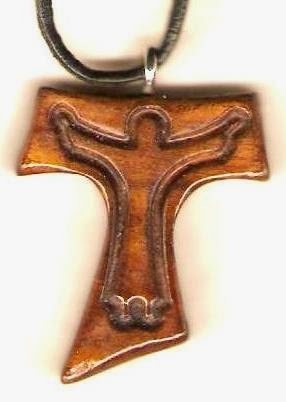 He had a twofold reason to promote devotion to the name of Jesus; first as a simple and effective means of recalling God's love at all times; and secondly, the symbol displaced the superstitious symbols of the day, as well as the insignia of factions (for example, Guelphs and Ghibellines). 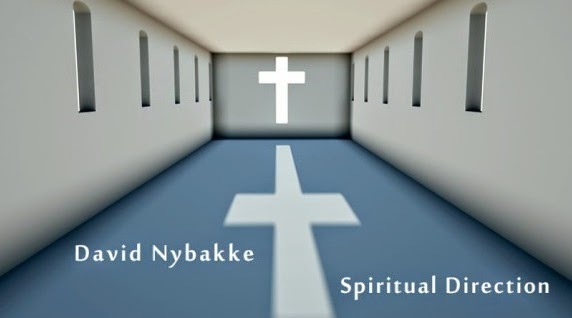 The devotion spread, and the symbol began to appear in churches, homes and public buildings. Opposition arose from those who thought it a dangerous innovation. 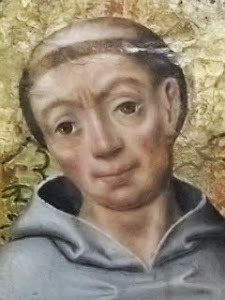 Three attempts were made to have the pope take action against him, but Bernardine’s holiness, orthodoxy and intelligence were evidence of his faithfulness. Bernardine was widely admired throughout Italy, and he was offered the office of a bishop on three occasions. Each time, however, he turned down the position, choosing to preach throughout most of Italy several times over, and even managed to reconcile members of its warring political factions. 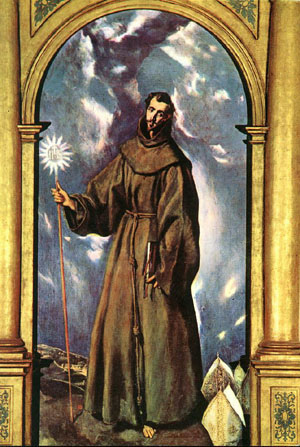 Later in his life, Bernardine served for five years as the Vicar General for his Franciscan order, and revived the practice of its strict rule of life. Then in 1444, forty years after he first entered religious life, Bernardine became sick while traveling. He continued to preach, but soon lost his strength and his voice. St. Bernardine of Siena, at the age of 64 died on May 20, 1444. Only six years later, in 1450, Pope Nicholas V canonized him as a saint. ** From IDEAS producer, David Cayley: "Human beings, according to French thinker René Girard, are fundamentally imitative creatures. We copy each other's desires and are in perpetual conflict with one another over the objects of our desire. In early human communities, this conflict created a permanent threat of violence and forced our ancestors to find a way to unify themselves. They chose a victim, a scapegoat, an evil one against whom the community could unite. Biblical religion, according to Girard, has attempted to overcome this historic plight. From the unjust murder of Abel by his brother Cain to the crucifixion of Christ, the Bible reveals the innocence of the victim. It is on this revelation that modern society unquietly rests. 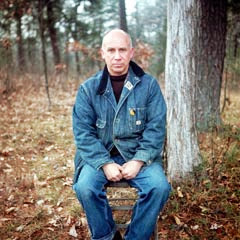 Girard's ideas have influenced social scientists over his long career as a writer and teacher." - IDEAS producer David Cayley introduces this seminal thinker to a wider audience.